The CSP Elite™ is an online educational program designed to provide real estate agents with the knowledge they need to leverage a leading marketing concept. This comprehensive workshop provides insight, principles, best practices and strategies for agents to assist property sellers to maximize equity gain during the sale of a property. Completion provides a thorough understanding of the process and how to easily propose property staging to clients. Do you see the importance of detailing your car before you sell it? Would you prefer someone else handle the ‘sticky’ conversations about your client’s property to preserve your relationship with them? Would you be interested to know more about a proven way to have listings sell 90% faster than average? Would you like to attract more listing appointments? 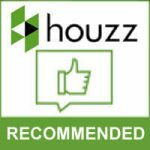 What would happen with your reputation if you were known as the “must see” property agent? All this and more is possible when you understand the ins and outs of how staging works for you, your client and the buyer. You have likely heard something about staging; it is a powerful, practical marketing strategy used to enhance property for sale. The results, time after time help secure the most money for the client in the shortest time. 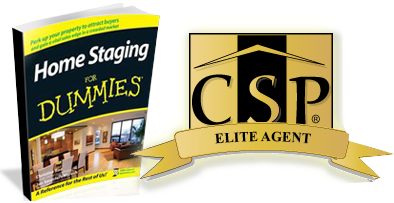 Certified Staging Professionals® use a three-step process to maximize the buyer opportunity. Where ever the eyes rest, the sale begins. Step one: is a consultation to identify the condition items which affect the sale. Step two is the fulfillment of the recommendations, creating the canvas for the truly important part. Step Three: At CSP® we call it “showcasing”; placing the furniture, lighting, artwork and accessories to maximize impact for great photographs and showings. CSP® staging professionals use a proprietary process using psychometric selling techniques to merchandise the space, creating positive impact points for buyers, from the minute they walk through the door. Staging is a marketing concept for real estate that was literally created in a slow market to move properties faster and easier; over the years it has become the single most important tool you can suggest your client employ to maximize the impact of the work you do locating a buyer. In today’s market it is a necessity for any property sales transaction! 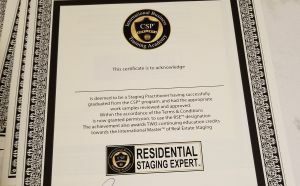 The Real Estate Staging Association, through whom CSP® is accredited, reports that staged homes are on the market 90% less than non-staged homes. Staged properties reflect maximum values for your clients and create connections between potential buyers and your client properties. And all that’s wonderful but if you are like most agents you want to know the answer to the most pressing problem: how to convince your client to understand the value of staging? SOLUTION: is what the CSP Elite™ Agent Staging Training Program teaches you. We believe agents are busy enough without adding the stress of actually doing staging work themselves. After all you don’t do house inspection, mortgage arranging or title searching so why would you schlep furniture? The five factors that determine a sale, and where staging fits! Pricing, contracts – what to expect; who pays and much more…!!! To be clear, you will not learn how to stage or how to start a staging business. You will learn how to incorporate staging services into your existing real estate business, for maximum impact on your bottom line. You will discover how to market staging to attract more listings, how to use staging services to close those listings faster (and with better results) than if staging was not included in the marketing process. SCRIPTS: Of course, you’ll also learn how to overcome objections and communicate effectively with the property owner to secure their cooperation in preparing for the sale. 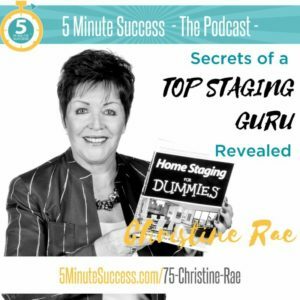 Also the information needed to choose the right professional stager for you..
You will receive 2 two-hour “live” recorded learning sessions taught personally by Christine Rae personally. 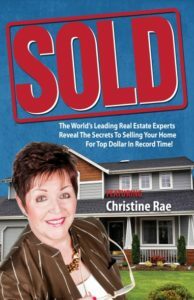 A companion workbook, Maximizing Your Client’s Equity with Staging, with the lessons and information for easy reference. An open book exam to certify your knowledge post-training, which is needs to be completed to earn the prestigious CSP Elite™ Agent designation and are granted permission to use the CSP Elite™ agent logo in all marketing and promotional pieces for two years from your date of completion (renewal thereafter is $50). 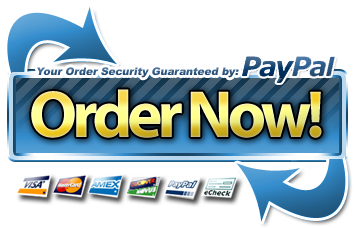 Upon payment, you receive the above materials via download link. Please complete the exam as quickly as possible and return that to CSP International™ to receive your certification. Once your exam has been verified as successful, you will receive the CSP Elite™ Agent logo via email. We appreciate there are choices for training out there; CSP International™ is the leader, having had the most direct impact in developing the industry. One of our specialties is helping real estate agents be more successful. 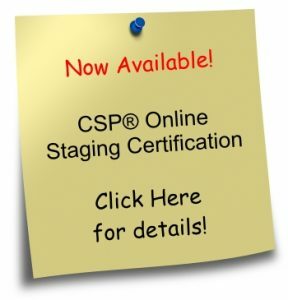 Even if you have existing knowledge about staging, you will find that CSP® offers a comprehensive curriculum based on best practices for profitability, professionalism, business and efficiencies (many of them set by CSP®). Maybe the biggest reason to take the Elite™ Program is because your competitors are catching on to get the marketing edge in your local area. “It is a great marketing tool that I was introduced to about five years ago, by a CSP stager. Sam knows about hard work, success, and the power of staging. He and his team topple sales records year after year. He holds the most awards of agents in Canada, he knows staging works. FREE: DOWNLOAD PDF article HERE. To purchase the recorded version of the CSP Elite™ webinar including workbook. 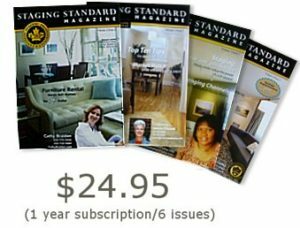 When you BUY NOW you will also receive a $50 BONUS: 4 MP3 program plus workbook: SOLD Presents Protecting Your Clients Equity Through Home Staging click the button below. Special Note: Broker advantages are available!